We have received numerous requests from those who knew and loved Larry Gibson for a way to share their memories with his family. He touched thousands upon thousands of lives and we've been overwhelmed by the notes people are leaving on his facebook profile, photos of people with him, and notes that we're getting from people. 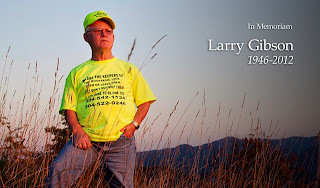 We are setting up this form as a way that you can tell your favorite story or memory of Larry (or more than one if you'd be inclined to share them) that we can collect and give to his family. It might be good to first type your memory in a place where it can be saved or is more "viewable" than in the form below, so you can avoid it being lost and be more comfortable writing, and then copy and paste it into the form to be submitted. We are looking forward to reading all of the amazing stories that people have of Larry. One thing he loved was telling a good story.